The British Veterinary Association (BVA) has said it is concerned about figures revealing that almost two-thirds of food companies have no information on their commitment to stunning animals on slaughter. Meanwhile, it was claimed that only 4% have “universal commitment”. The findings were published in the Business Benchmark on Farm Animal Welfare report (BBFAW) on Wednesday 27 January. It was also shown that slaughter without pre-stunning was the only welfare measure that reflected a decline in the percentage of food companies that had a specific policy on the practice. Figures were down from 34% in 2014, to 32% in 2015. He said that the industry needed to acknowledge consumers’ concerns surrounding the welfare of the animals they were eating. “The European Commission’s study of 13,500 meat consumers across Europe found that 72% wanted information about the stunning of animals at slaughter,” he added. The BVA has run a long-standing campaign to end the practice of non-stun slaughter within the UK. A 2015 public petition in support of the campaign gained 120,000 signatures. It is believed by the BVA, with backing from leading farm animal welfare organisations, that all animals should be stunned before slaughter to render them unresponsive to pain. The BVA also claimed that scientific evidence supported the use of pre-stunning in slaughter. Last year, two-thirds of BVA members highlighted the issue as one of their top three priorities for government. However, this is not reflective of the entire industry. BVA’s comments about the lack of information surrounding slaughter conflicts with the practices carried out within the halal sector. 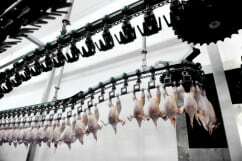 Shaykh Tauqir Ishaq, head of certification at the Halal Authority Board (HAB), said that the halal method of slaughter is the most humane in the country. “I think gas stunning is far crueller, unpredictable, and can’t really be controlled,” he told Meat Trades Journal. In the past, Ishaq sent an open letter to BVA’s then president Robin Hargreaves to address some of the conflicts between the organisation and the halal sector. Despite this, it was claimed by Ishaq that he did not receive a proper response. Ishaq suggested that the BVA should focus on other issues, such as goading livestock.